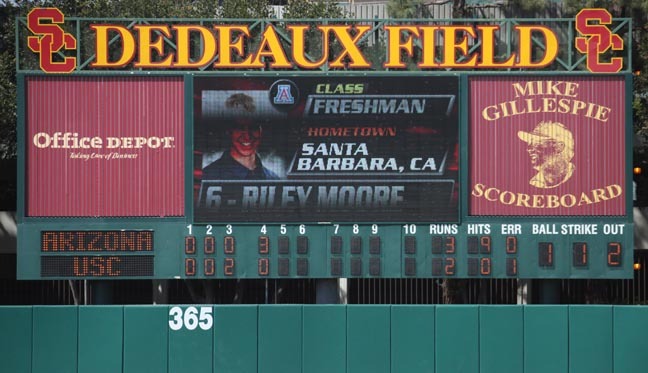 One of the nation's finest collegiate baseball structures, Dedeaux Field has continually been improved over recent years with the grandest project taking place before the 2002 season. A $4 million project signified the largest improvement made to the facility as a new clubhouse and players' lounge were added on the first base side. Expanded offices for the coaching staff and new Hall of Fame were also part of the project, along with a new restroom pavilion. Prior Plaza, named after Jerry and Millie Prior (parents of former Trojan Mark Prior), is located on the first base side and features USC's All-Americans and players who have played in the majors. For the 2008 season, the million-dollar Rod Dedeaux Research for Baseball Institute (RDRBI) will add redesigned batting cages, a new weight room and state-of-the-art video motion analysis. A brand-new Daktronics scoreboard with a video board will also be installed. A new bleacher section was added on the first base side, pushing capacity to 2,500 at Dedeaux Field. In the fall of 2003, the drainage system was upgraded with new grass installed for the entire field. In the summer of 2007, construction will take place on a new set of batting cages to replace the current complex off the third base side. Prior to the 2000 season, the press box was expanded while in 1994, a state-of-the-art scoreboard/message center, which was donated by the Port Family in memory of Al Port, whose two sons, Randy (1967-69) and Jeff (70-72), both played baseball at USC, and whose grandson, Ryan, also was a part of the program was built in right field. 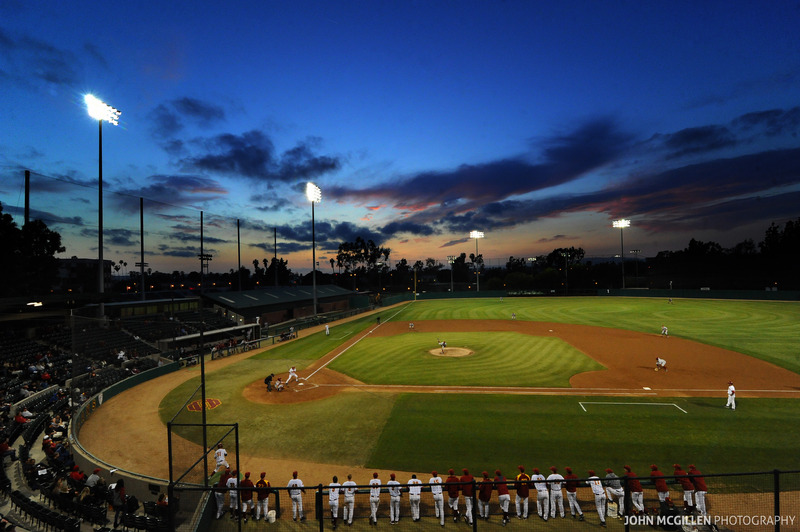 With dimensions of 335 feet down the right and left field lines, 365 in the right field power alleys and 375 to the left field power alleys, and 395 to straightaway center, Dedeaux Field is a natural grass field and seats more than 1,800. The outfield fences stand 10 feet high. The lighting is comparable to most professional baseball fields (with footcandle power of 82 in the infield and 71 in the outfield).